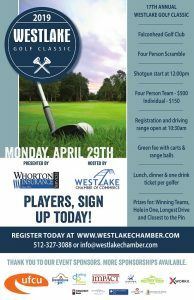 The 17th annual Westlake Golf Classic will be held this April 2019 at Falconhead Golf Club. The event is a fundraiser for the Westlake Chamber of Commerce and is designed to mobilize “local businesses to connect with the community, while offering an experience at one of the region's premier golf courses.” The four-person scramble provides funding resources for professional development workshops, speakers, and community outreach programs and is presented by Whorton Insurance. This year’s event will be held on Monday, April 29, 2019 from noon to 7 p.m. Registration and Driving Range begin at 10:30 a.m., with a Shotgun Start at noon. Fees are $500 per 4-person team or $150 per individual player. Admission includes green fee with carts and range balls, plus lunch and dinner and one drink ticket. Golfers also will receive a swag bag, and there will be raffles and giveaways. Prizes will be awarded for Winning Teams, Hole in One, Longest Drive, and Closest to the Pin. Sponsorships are still available and run in investment from gift card donations up to $2,500. They range from Prize Hole Sponsors to Beer and Margarita Hole Sponsors to a Putting Contest Sponsor and a Cart Sponsor. Contact the Westlake Chamber of Commerce for more information on sponsorship and to register for the event. Sponsors include Kerbey Lane Café, Hyde Park Schools, Whitley Penn, Commerce National Bank, University Federal Credit Union, Thundercloud Subs, Darling Promo, Independent Bank, Community Impact Newspaper, Belmont Village, WORK X, Baylor Scott & White, Capitex Homes, Benchmark Bank, and Granduca Hotels.